I am finally getting the blogging 'spirit' back. I lost it for a bit back there and along with being a bit busy I just neglected the whole idea of snapping and typing. Now however I enjoy every tap that my fingers get to do whether it's on the camera button or the keyboard. That's not what I'm here to talk about today though, you see I have been very into red lips lately and I figured it was about time I introduced you to my little red collection. As you can see I am leaning over on the drugstore side but when it comes to lip products I find that the 'high street' brands do them just as well, if not better sometimes, as 'high end' ones. I am a sucker for longevity so 3 of them are of the 'lip stain' sort (#4, 5 & 6) and the cherry lip pencil is something every red-lip-loving girl should have. It is brilliant, gorgeous and does not leave your lips. 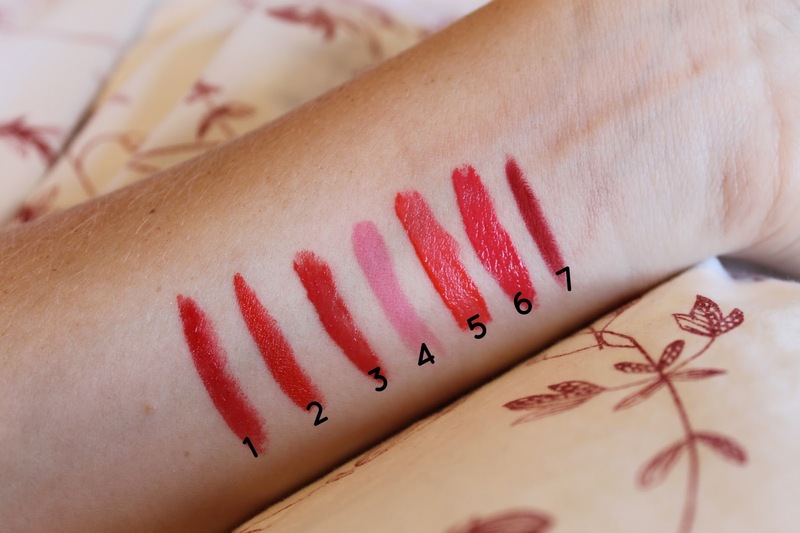 The lip butter is definitely the sheerest out of the bunch but just like the Bourjois Rouge Buzz it can be both very sheer and very opaque, depending on how you apply it. 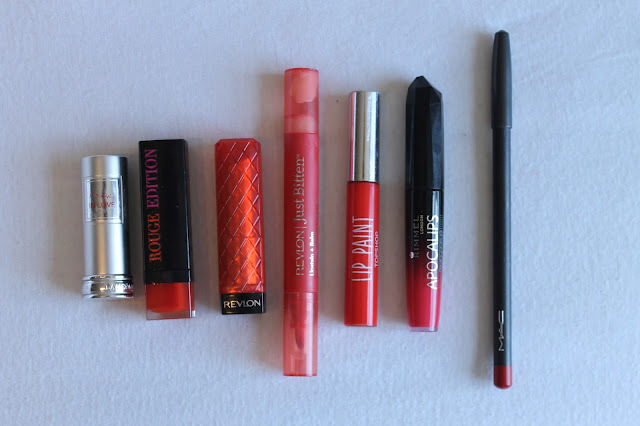 My go-to glamour red is the Lancôme one. It is silky smooth, a bit glossy and the most perfect shade of red. So those are my red babies that I have been whipping out a lot lately. Nothing beats sunkissed skin, light, natural makeup and a bold red lip. I would love to hear what your favourites are when it comes to bolder lip shades, so let me know in the comments! Also, I now have a facebook page and would love you to death if you'd head over and click the like button :) Link HERE! I love red lips!!!! The next time I see the Rimmel gloss I am going to pick it up. 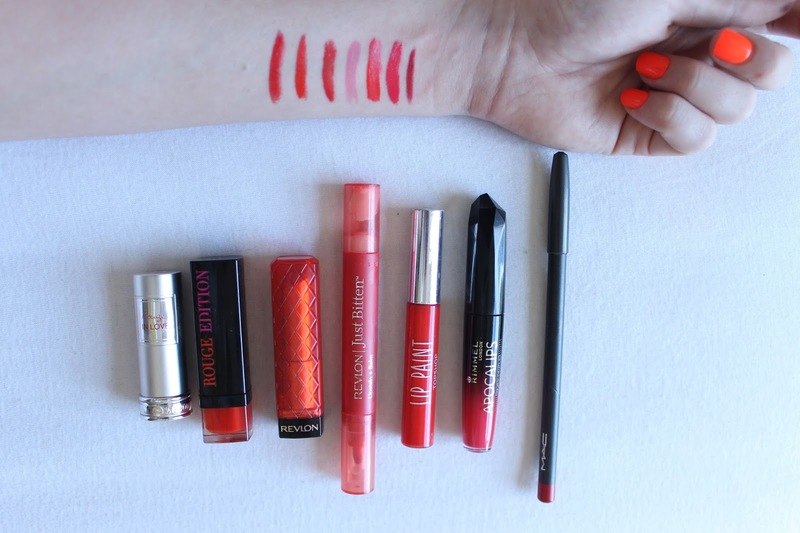 A lovely selection of lippies, I do love a nice red.